Girls Rock Columbia always welcomes reliable, dedicated volunteers who support our mission. Our programs would simply not exist without our volunteers. We appreciate your skills, time and enthusiasm! We have several opportunities with varying time commitments, from just a few hours to several weeks. Some positions require musical experience, but many do not. Volunteers must be at least 18 years old. All positions are open to female, trans and non-binary individuals. Review the volunteer positions and requirements listed below. Submit a volunteer application form. If you’d like to volunteer as a Workshop Facilitator, please review the suggested topic areas and submit a workshop proposal in addition to the volunteer application. Complete a $10* volunteer background check. (An email regarding background checks will be sent to volunteers after they sign-up). 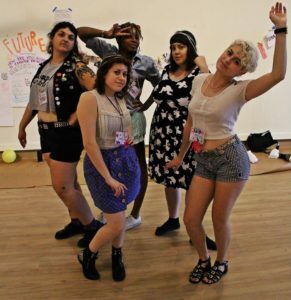 *Girls Rock Columbia strives to be accessible for all volunteers. If you are unable to pay the $10 fee, please contact us at hello@girlsrockcolumbia.org and we will make arrangements to cover the cost for you. figure out stage moves, etc. On the occasion that a personal issue arises for campers, you will be available to talk with them and/or refer them to services if needed. This role has a flexible schedule. A licensed nurse is needed on-site all week. You will provide health care services to campers if needed. This role has a flexible schedule. Snacks are donated for the campers to enjoy twice daily. As a food team member, you will pick up food donations, go on supply runs and prepare food as needed. This role has a flexible schedule. This role assists with the daily camper check-in and check-out. As a pick-up/drop-off assistant, you will also monitor visitors, coordinate in-camp communication, provide directions, answer questions, and (possibly) sells showcase tickets. This role has a flexible schedule. Help us set up, break down and move equipment throughout the week. No music necessary. This role has a flexible schedule. You’re a go-to! This role helps with last-minute needs, i.e. running to make copies or the hardware store, filling in if another volunteer can’t make their shift, and help out as situations arise. This role has a flexible schedule. We need hands on deck to sell tickets and merch, fold programs, and help ensure that all aspects of the showcase concert run smoothly. Must be available on the Saturday of camp. Interested in joining our outreach efforts? Email us at hello@girlsrockcolumbia.org for information on how you can help.